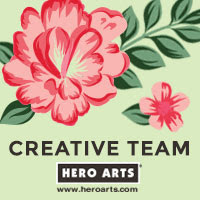 In celebration, we have a blog hop full of extremely talented guests as well as all of the fabulous design team. Each person on the blog hop will have a link to the next person but if you get lost please head over to Stephanie's blog where she will have links to everyone. There are also a number of prizes up for grabs along the way. Each person on the hop has a £20 gift card to give away, one lucky person will also win a £100 gift card, so make sure you leave comments at every step along the way. You should have arrived here from the amazing Maureen Plut. For my teaser today I am using the new Hanging Around stamp set and matching dies. I have first stamped the wreath using Versamark ink and heat embossed using Ranger silver embossing powder. I have coloured in four of the baubles using BV31 and BV34 Copic Markers and some Wink of Stella. This has then been cut out using the matching die. I have taken a panel of white cardstock and cut the wreath from it again. I have popped a piece of vellum behind it and then inlaid the first image on top. The sentiment, from the same set, has been stamped below and heart embossed. I have adhered the panel to some Bazzill Card Shoppe CS with foam tape and added a few HA Smooth Gems to the wreath. Thank you so much for visiting me today. The next stop on the hop is the super amazing Amy Wanford. Enjoy! The more I see it, the more I'm determined to get that wreath. Your's looks sensational with the silver embossing and so lovely with the soft lilac. Beautiful card. Love that you used non traditional colors on your card. Stunning! Love the inlaid die cut - silver and white is so stylish, too. I am now officially sold on NEEDING this stamp! Love what you've done with it, love all that white space and your clean lines. Love the colors you used, such a pretty card! Super stunning Michelle as always. Love, love, love your delicate colours and such a perfect layout and style. Gorgeous card Michelle, I love the non-traditional colours. As always, perfectly CAS! Oh, Michelle! Your color choices, stamp choices and layout make this card clean, classy and elegant. Beautifully elegant :) ..... sigh! An absolutely elegant card! I love the way you inlaid it with the vellum. Definitely something to try! Wow! Your colour choice is nothing short of amazing!! I love it! your card is truly stunning and it's my favourite colour too!! I must set my alarm for later so that I don't miss out. I love the colours, and it's a different way of using the die. The wreath card is SO beautiful. I love everything about it. Thanks for the video showing all of the new products! HAPPY BIRTHDAY CB!! Fabulous die cutting Michelle - LOVE it! O M G ! Love Love Love ! Love your non traditional colour choice. Totally gorgeous card! I love it! I think your first commenter had it right when she wrote, "perfection". Oh my, the combo of soft lilac with silver and vellum....using Stephanie's stamps....your style...I totally love this. Oh I love the colours you used, so effective. Gorgeous card Michelle. Love the colours and how you have used the die. Love the new stamps and as always the blog hop :) Love your fresh use of colors! I love unique colors at Christmas time and this is just perfect. beautiful card Michelle, i like the vellum accent and the lovely soft colours. This is a very pretty Christmas card. Though the colours are not the "usual" Christmas colours, I like them very much. The wreath with the gems looks very festive and the embossed sentiments looks great, too. Your wreath card is gorgeous especially the colors you chose to give it elegancy! Hello Michelle. What a great combination. Those different colours, Stephanie's stamps and wonderful inlay technique. Congratulations for all who have taken part. x Margaret Col. I love how you created that wreath. It's stunning. Great card, Michelle! And congrats to Steph!! Ah, I love your non-traditional wreath, so unexpected. Your card is absolutely fabulous! I loooove it! Beautiful card. Love the silver and purple! I love the lavender and silver! Just a gorgeous card. I love your idea with a wreath and so unusual colors for xmas card! Great card. The non-traditional colors really make a statement. Great card! Thanks for the opportunity and congrats to Steph! I love your clean cards! Wow...just beautiful. Love the colours you've used. Stunning. Non-traditional color sets this apart and is a piece of art! Such an elegant wreath! Love it! The inlaid wreath looks so pretty! This set is probably my favorite too Michelle!! I am new to CB stamps - only have one set - but just purchased a few more from this release! Love your style!! But you know that already :) Hugs friend! Very pretty card! Love these stamp sets. Congratulations on Clearly Besotted 2 year anniversary. Perfect. TFS. I love the non traditional look of your wreath! Gorgeous!! So pretty! Love your embossing and the gorgeous colour combo! Love the card - it is so elegant! Thanks for all the inspiration. Your card is so gorgeous Michelle. Totally gorgeous in these icy colours! Your card is a knock-out beauty; a fabulous showcase of the new release! I'm swooning over the eye-catching perfection. Thank you for the video! I love this...The colour choice is perfect! Beautiful wreath !! So soft. Beautiful card, Michelle! I really love your CAS design...so pretty! Super release, enjoyed the video and I love your choice of colours for this Christmas card. An unusual and pretty color combination. pretty card. Beautiful - love the untraditional Christmas colour - fab! Pretty card and nice video! A window behind the wreath. I like that! And the purple is an unexpected color choice. Very good. Thanks. Stunning card. Simple yet very elegant. Love, love, love that wreath stamp and die! The vellum window is perfection! LOVE that you used purple here!!! Super pretty! Such an amazing card Michelle love the soft colors. What a lovely, elegant card, and such a clever idea to put it back into the cut-out card. What an elegent looking card. Just beautiful. So clean looking. Purple isn't one of my fav colors but I sure love it on you're card. I so love seeing such new ideas. Beautiful work. Such a great new release. I just love the wreath. What a pretty card. Love that wreath. One of the many things I like about blog hops is seeing the different interpretations and ways to use stamps and materials by the artists. This wreath is so elegant and stunning. Nicely done! 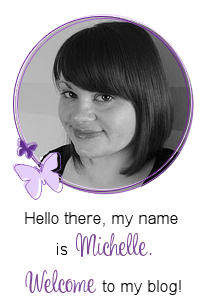 Beautiful designed, as always, Michelle! Love the inlaid part of the wreath! Awesome video. Love your card! I just love this wreath and the color is beautiful. Lovely card! Very elegant in non-traditional colors. Such a beautiful Christmas card. Love purple. OMG and WOW Your card is so beautiful. when I saw it .... it I was in awe of what you created. I couldn't wait to read your recipe and see your video as to how you did it. I love it and girl you are sure one super talented gal. You definitely create with passion!! What a classy, elegant card! When I looked at it, I immediately thought of my mom. This is something she would love! Thank you for always sharing such wonderful inspiration! Really enjoyed the video showing all of the release. I love the wreath card....lovely colors. Oh my, do I ever love the colors in this card. And that sweet wreath. Gorgeous. Beautifully elegant card...the colors are wonderful!!! I love how you've added that layer of velum to soften everything up. Very elegant - love the colours you've used. Love the card, so pretty. Beautiful wreath card and your video was fantastic showing each set. Gosh sure is a lot that I want now. WOW! Beautiful card. Crisp and clean. Love it. Squeal!!!!!!!!! So soft and pretty! Elegant perfection! OH - Everyone else has done this wreath in greens and reds, but I LOVE your take on it with the embossing!! LOVELY! absolutely gorgeous!!! that lavender and silver together...da bomb! one word sums it up! Gorgeous! Love the use of vellum in that wreath. NIce! One word sums it up! Gorgeous Michelle! Thanks for the video! A fabulous release! Thanks for the run through. I love all of your cards! WOW! This is stunning Michelle. Your design is so stylish and elegant. I really love the way you have used the die and the colours are gorgeous. What a beautiful and elegant card. Really liking this wreath stamp. Such an elegant card!!! Love that you used pale colors to accent the wreath! So very classy and elegant! I must have this stamp and die set!! TFS! I love this! The wreath is beautiful, and the soft colours are perfect! So lovely! Beautiful color of your card! Love these nontraditional colours and inlaying technique you used. What a wonderful release. The stamps are so versatile. Beautiful, elegant card. I love it! Very pretty with the silver embossing and I like the inlaid technique. Thank you for showing the stamps and dies. That really helps me decide what has to be purchased first. lol. so pretty. Love the wreath. The colors look so elegant together. Beautiful card. One of my favorites of the hop. Love the elegance and pop of color on your card! Lavender love this color for Christmas! Beautiful with non traditional colors! So elegant and beautiful! I really am crushing on that wreath! Very pretty! I enjoy your video. Thanks so much. I love how you made the wreath look so elegant! Gorgeous card! Stunning card...love the inlaid, what a great wreath! Omg, your card is amazing !!! Love this wreath and all the colors you used ! A truly elegant CAS card. Love the look the vellum gave to the inlaid wreath. The colors on your card are so beautiful. Love the soft colours and vellum, very elegant card. Have a lovely day. Love the lavender and silver color or your card...beautiful! And thanks for the video...so I can see just what i want to purchase...or hope to win!! Pretty card. Love the sweet colours and the lovely embossing! I am changing my mind and now the wreath is becoming my favorite new set. Gorgeous! Your card is lovely. I can't wait to get those stamps! What a truly beautiful and elegant card! I didn't see my earlier comment, so am posting again. If it already showed up, sorry!! Lovin' the pop of lilac - a gorgeous card! So pretty and I love your choice of colors. Your card is lovely, especially the inlay. This is a incredible release. I have always loved your style Michelle, the inlayed design is right on trend and this is such a gorgeous card! I'm loving this wreath stamp the more I see it, and I adore how you've used it here with this fabulous colour palette too. Truly stunning! Oh, this is absolutely gorgeous! The colours, embossing and vellum window, elegant! 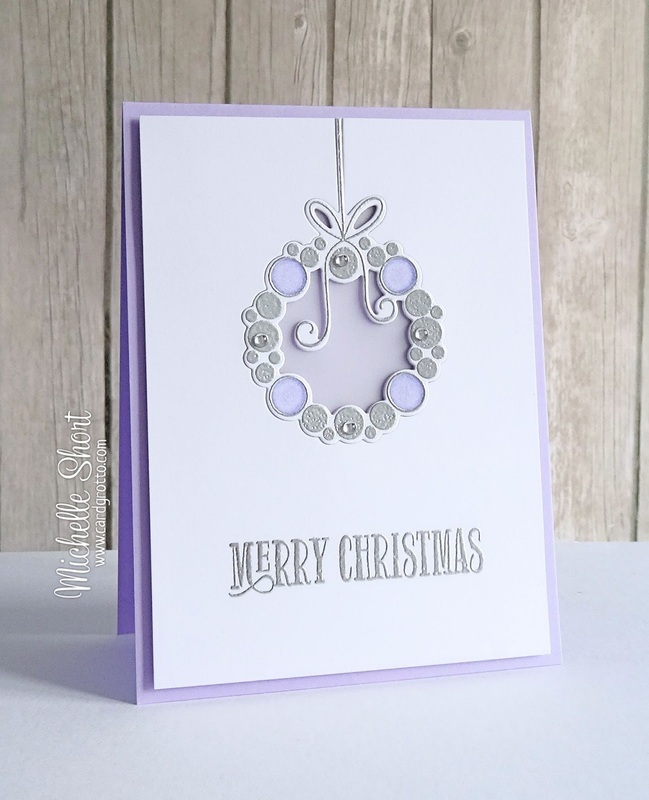 Gorgeous card, love the vellum, silver embossing and your choice of soft lilac to set off the wreath. It feels like a very peaceful and calming card. I love your card, so clean and simple and easy to make a lot of them !!! I do so love the colors you chose for your card! Absolutely wonderful! Those colours, my favourites, are just gorgeous. Can I replicate it?Thanks for th chance to win.